TOYOTA CITY, Japan (AFP) – The US transport chief told Toyota on Monday that Washington "will not sleep" until it is sure the Japanese car giant has improved safety and warned of the possibility of more fines. 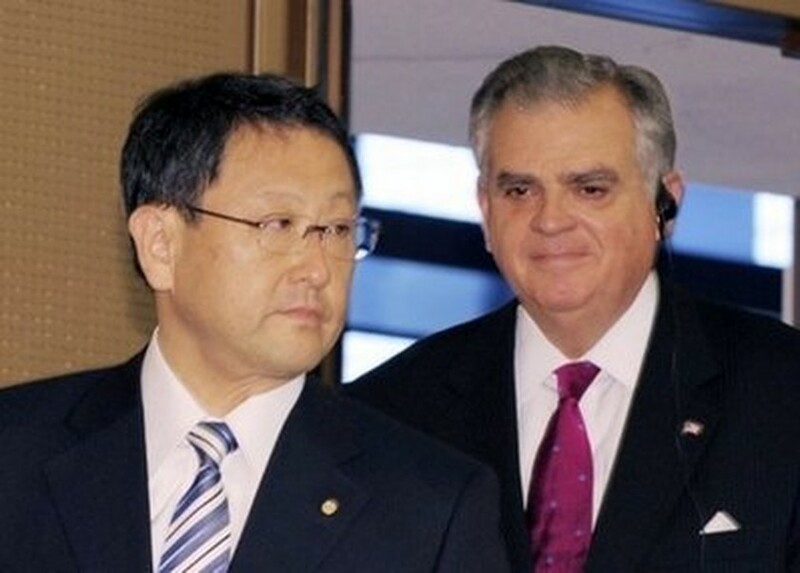 During a visit to Toyota's headquarters, Transportation Secretary Ray LaHood said that he and Toyota president Akio Toyoda met for "tough, but respectful and serious discussions" about Toyota's commitment to safety. The world's biggest automaker has seen its reputation battered after recalling around 10 million vehicles worldwide, mostly for problems with sudden acceleration which have been blamed for 58 deaths in the United States. While Toyota's safety pledges since then have been "very encouraging," LaHood warned that the US government "will watch very carefully for improvements" and will look for tangible results from the automaker. "The proof is in the pudding, and Mr Toyoda understands what that means," said LaHood. "It's fine to have these measures in place but they need to be carried out. We will not sleep until we are sure that all Toyota vehicles are safe for American drivers." He added that the possibility of the automaker being hit with another fine, after it agreed to pay a record 16.4 million dollars in April to settle claims it hid defects, hinged on an ongoing review of 500,000 internal documents. "We will review all of the documents that we have received. We will make a decision on what happens after that," he said. The US transportation chief had previously criticized Toyota for the length of time it took to respond to its recent quality issues, describing the company as "safety deaf" in congressional hearings in February. His invitation to the auto giant's headquarters follows Toyoda's February trip to the United States when the Toyota chief tearfully apologised for safety woes following a tense appearance at a congressional hearing into the problems. Toyoda pledged to overhaul quality control measures, including creating a new US safety post, and requiring executives to do test-drives. The company has also said it would speed up the recall process and improve quality control. "We are making strong progress in delivering on our commitment," Toyoda said, adding that the company was working "to ensure that all Toyota vehicles remain safe and reliable for our customers". Toyota has also been hit with at least 97 lawsuits seeking damages for injury or death linked to sudden acceleration and 138 class action lawsuits from customers suing to recoup losses in the resale value of vehicles. The recall crisis triggered a ratings downgrade by Moody's over concerns that product quality issues and the cost of litigation will dent Toyota's future profitability. However, the automaker is expected to announce a swing back to profit in the past fiscal year when it releases its earnings results Tuesday, with the full impact of the recalls to be realised the following year, analysts say. LaHood's visit will also see him meet with Toyota rivals Nissan and Honda and assess Japan's famous bullet trains as President Barack Obama looks to expand high-speed rail in the United States. Japan is pinning its hopes on the United States choosing its technology to develop high-speed rail, but it faces tough competition from China, France and South Korea.